The Atmospheric River apparently stopped-off down in Fiji for a Luau and has not yet recovered from the rum-soaked bacchanalia and is stumbling slowly northwards – or something – so the day dawned clear with high overcast. Maybe rain tomorrow night. 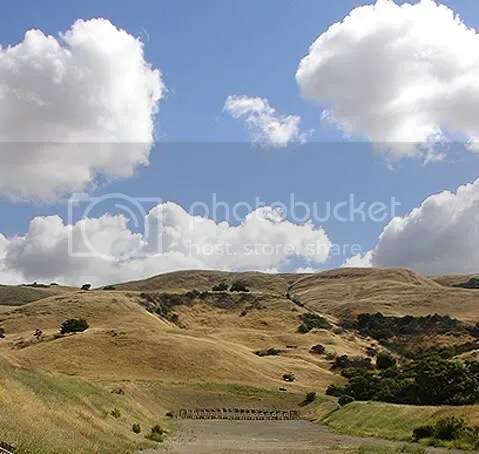 Yesterday I went up into the mountains above Pleasant Valley and met Don, the guy from whom I’m buying the .44-40 – and picked up a couple boxes of ammo that he no longer needed. 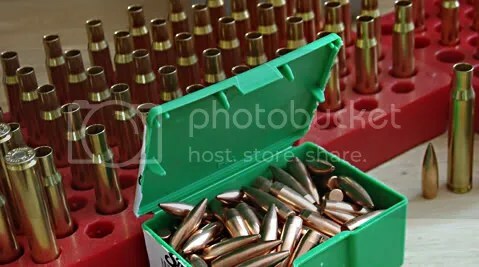 Here’s 315 shiny bright cases of Black Hills Ammunition Company brass, and then a couple hours later another 300. Inspired by the post of poor, ill, Phlegmfatale (go wish her well), this is yet another derivative-posting. What DO we have here? It’s a miniature rocket-ship sans payload! It’s the pimple-faced Teenage Rocketeer next to the hulking Sgt. Rock of the ThuttyAwghtSix Infantry Division. 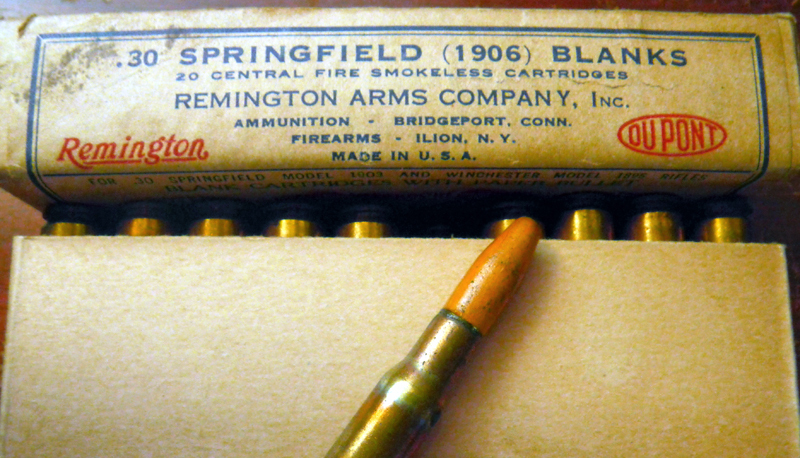 It’s .223 vs. .30-06 brass and 53 flat-based copper-clad grains against 155 boat-tailed ones. And it’s also what those small holes in the red-plastic tray are used for. I’ve fallen desperately behind in things, with still a half-hundred-plus ’06 loads to load, and here already arrived are more of these tiny chaps. It’s a slump and a conflict. The only thing saving me from jumping-in and deep-sixing myself in total organizational meltdown is that I have no .223 shell-holder. I just need to get the Garand loads done and out of the way. I hate being scattered and disorganized – it eats at my brain. But I also need to go outside and walk around in the sun because it’s a fine Summer day with gentle breezes and a huge waste to spend it indoors. So in the end, to preserve and guard me from Chaos remains the the duty I started, have to finish those stalwart loads. 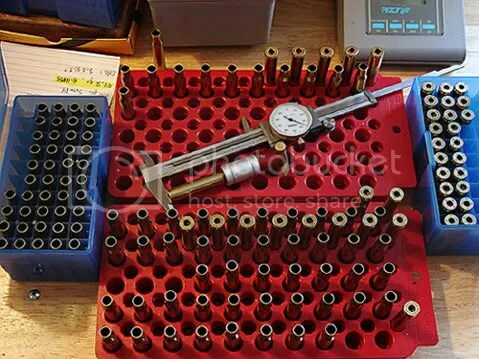 46-grains of H4895 must be first dispensed into the primed Nosler brass that’s been sitting patiently for months before I proceed to duplicate that process in miniature. I need to keep my eyes on the front sight. On another note, the Reno thing has gone iffy and fuzzy – timing is not shaping up. But it’s since it just fuzzy, maybe things will clarify and resolve in the interval. 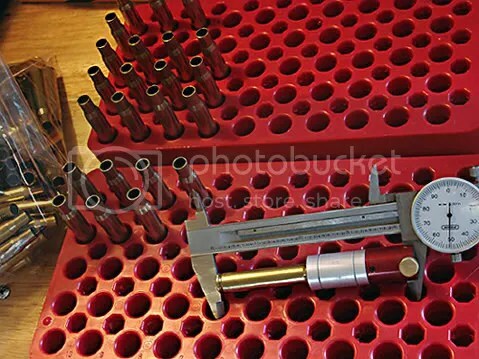 I went and bought an RCBS #10 shellholder for .223 Remington…Nobody try to stop me! 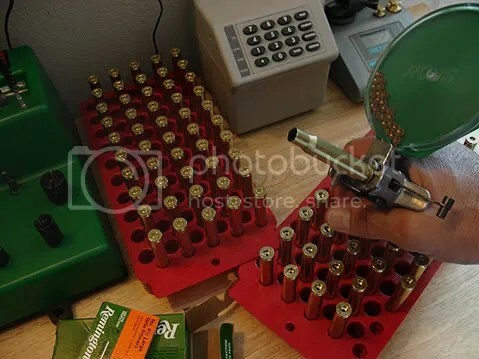 Pressing home CCI-200 primers by hand in fresh Nosler 30-06 brass, I am preparing for this weekend’s Match. 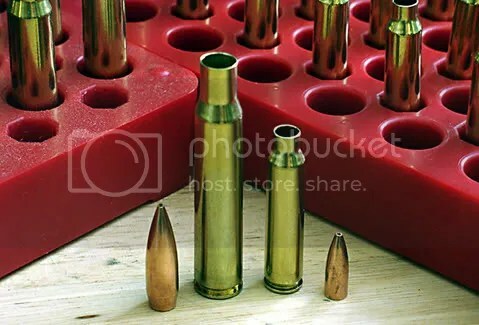 I will top it off with a Sierra 155-grain HPBT called the Palma Match over 46-grains of H-4895 to compare and contrast with the performance of the Hornady 150-grain FMJBT’s, and see how well they glides downstream towards the targets. The weather forecast is for more of the same so bring sun-screen. In the Slough of Despond, the Lost Time Between Worlds, during the dog-days between Christmas and New Years Resolutions, I came across a nice little, used, .20-gauge Wingmaster that gave me considerable pause to think. The voices in my head grew loud while the Christmas Money in my pocket jangled like a Salvation Army bell-ringer on crack. I was like a trout on a Mepps. I needed a time-out, so I emailed a buddy back in the Frozen Upper Midwest who knows a bit about shotguns, quite a bit. Awaiting his reply I took a deep breath and went to a few other places where smallbore scatterguns exist. I had to think strategy, not gimmee. 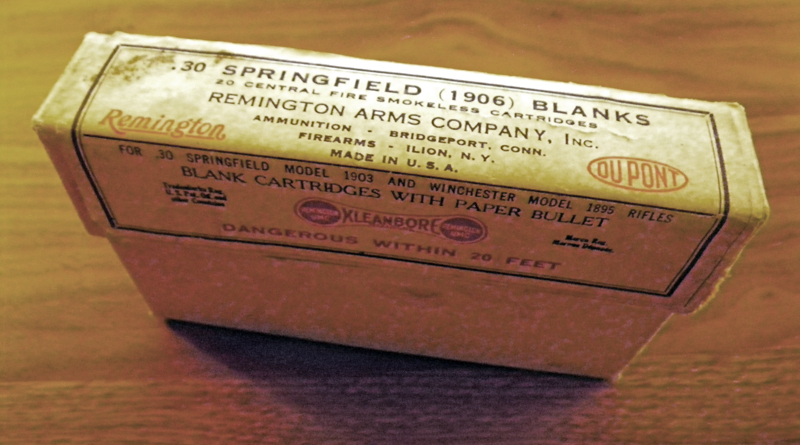 At one Emporium-of-Exotica-and-Militaria there were some fine samples; a Browning A-5, in 20-gauge with a fitted box-case for $750, or a fine old Ithaca M37 in 16-gauge for half-that, or a Winchester Model 12 in 20…. I wrote down sizes and numbers in a little notebook. What to do? I’ve never hunted and don’t even know any hunters. Yeh my cousin duck-hunts with some buddies off the levees up north, but he’s an hour and a half across the Bay through the worst Liberal BMW and Lexus traffic you can imagine. Haven’t seen him in a couple years. Hell, I don’t even see my brother very much and he’s up there too. Then came the Pushback. It was Newish-New and all my stuff is old. I’m not sure what to do with a slug-barrel. I have little space for more guns – so with the space it takes-up I have to be sure that The Gun is Happy as much as I’m Happy, it has to see use. We’re at the point where if/when something new comes in, something old or useless has to go out, and we determine that in an instant at this time of year when we clean-out before New Year’s. My friend’s e-mail reply came, and in it he asked me if I was at-one with the Garand? He thought it sounded-so. I thought, but-sorta – I want to be better. So there’s no little .20-gauge in my closet, but an order from Midway is headed this way instead. 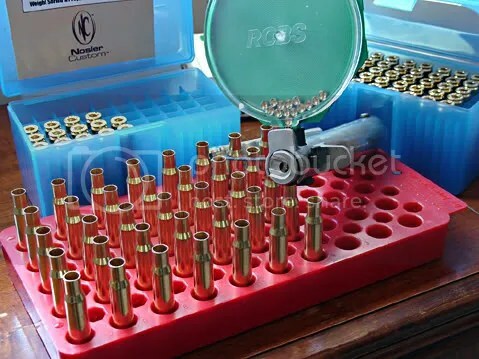 On-sale I found premium brass from Nosler and Hornady bullets. There’s still a compositional element involved, bullet and charge weights. But the chubby ladies of Lake City ’66 will have to wait for another damn brass-weighing contest. Not for a while anyhow. The question is, how much does shoulder dimension affect accuracy? I’m running the decapped brass through a Stony Point Comparator and separating them based on a wide variety of readings, from 2.043 to 2.051 – with many so-far at 2.047-8 and another group at .045 — and boy is it tedious. Maybe I should just separate them by weight. Ok here’s the deal, according to my abusive dial-measuring technique: in the blue box on the left they’re all 2.045 (quite a few) and in the blue box on the right they’re all 2.043 (second spike on the curve) and the ones in rows on the loading blocks are each a line different starting at 2.040 at the top and going to 2.050 at the bottom of the picture. A few are off-the-chart like the one in the comparator in the center at 2.036 that’s the same as the other one off the block at the top of the pic. Also there’s another grouping in the row at 2.046 and a larger group at 2.047 – it’s just weird I guess, the way they’re spread across a curve with two “plateau” points. I’m going with the plateaus when I load. There’s really only one recipe for the Carbine when shot from the Carbine, with the spice choices limited to salt or pepper: a 110-grain round-nose or a 110-grain FMJ. No vanilla or saffron here, no exotic bouillabaisse coctktail. A friend from the Club with too much stuff and too many interests to pursue sold me his Carbine dies, powder, brass, and bullets. 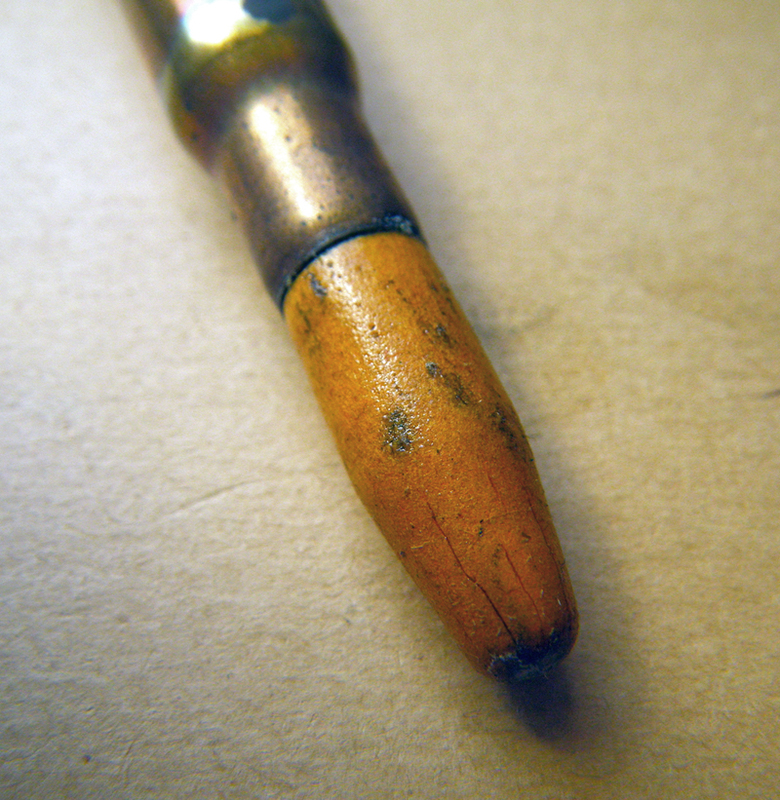 Now I have a 3-die bullet set to learn, and with it taper-crimping – this is new territory, change is good. Ok, fine whatever. In my Sierra manual H110 powder is shown over other powder choices as both the accuracy load and the hunting load – but I’m only interested in the accuracy part. 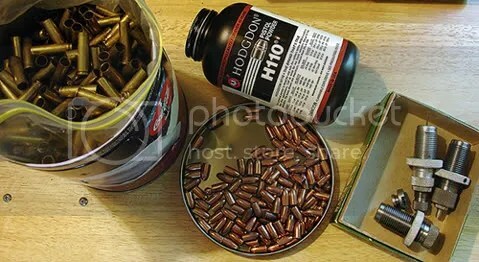 I have about half a pound but the requirements are small, tiny even – 13.8 grains. More on this later as development proceeds. There’s a Match tomorrow and the weather looks fine – hot, dry, and brown already but that’s they way it is here. It be gettin’ a bit tiresome. Good grief, I’ve been at this (not totally focused) brass-trimming for two days it seems, and there’s still more to do… The machine chugs along merrily making it’s little noises and there’s enough brass-filings scattered around from the military crimp remover and primer-pocket uniformer that I could easily fill-in the RCBS logo die-stamp cutout-thing at the top of the Trim Mate case-prep machine with them – so I did. Looks purty and sparkly. Oh well, the sun just broke through the clouds and I have an errand to run…but miles of brass to go before I sleep, or at least another 50. 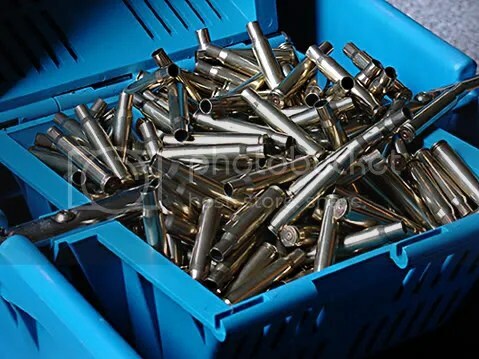 UPDATE: 100 little brass cylinders stand at attention – except for one thing ,one little physical detail that could improve ignition, uniformity, and downrange consistency…one more damn thing. 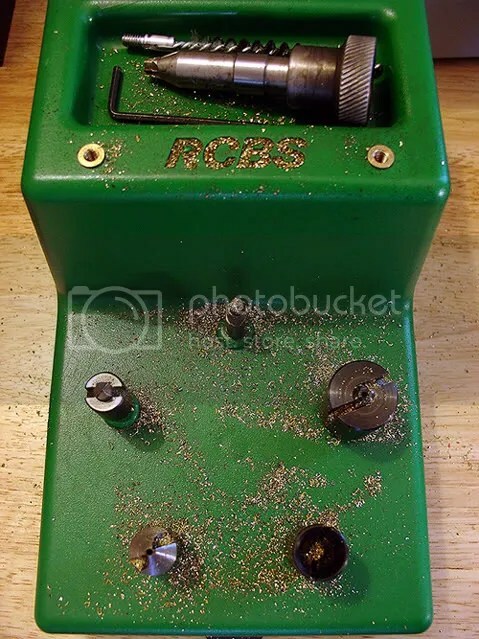 A simple observation of the tool’s utility was stated, This can make primer pocket swaging to remove military crimps vastly easier, and another very insightful tool-user observed, I use mine at station #1 in my RCBS Case Preparation Center as it has an 8-32 thread on one end. After resizing and trimming, I deburr and chamfer the case neck and then deburr/size the flash hole. Amazing!! Exactly what I needed – one more tool for the machine.